Yes, here is another website asserting that you can teach your baby to read. There are many out there, and I did much searching to get to where I’m at now. My journey in early reading actually began when I reading forum posts for elimination communication. They were talking about telling people about choosing to do teach your baby to use the toilet is akin to telling them that you’re teaching your baby to read. It’s almost a taboo subject, one the “experts” advise against, and is a decision that is likely to make your child a nasty little genius, or give him learning disabilities when he goes away to school. I was intrigued, and began searching for as much information as I could. I already knew that I would be the one to teach my children to read, because I’ve always wanted to homeschool my children. Indeed, in courtship, I was very firm that I would be homeschooling my children, and was fortunate enough to find a man who had already decided that it was something that he wanted to do. To make a long story short, I found Glenn Doman’s “How to teach your Baby to Read”. I was hooked. I then discovered the how to teach your baby to read yahoo group, an online forum which has inspired me, helped me grow, and shared in my joy of teaching. It’s a wonderful community, where I have truly formed friendships online. And so I began teaching my son to read. In the beginning, it was a bit discouraging because I did not know if he was learning anything, but I kept working. Then, when he turned 19 months, he read his first word. The word was "baby" printed with magnetic letters on our fridge. At that point, he also recognized his name, and was becoming more solid with his letters. Instead of teaching him the letter names, I focused on their most common phonetic sound, and he started identifying them much earlier. At 19 months, he knew A, B, D, F, M, O, P, S and T, although he often mixed F and P up. When he was 20 months, he could identify all of his letters. He had also grasped the concept of reading left to right, and could blend letters. For example, I would point to a word like "fig" and say "f-i-g", and then he would say "FIG!". He also knew baby, Peter, dad and mom by sight. We've given him a lot of exposure to the alphabet with Dr. Seuss's ABC book, a wooden alphabet puzzle he does all the time, alphabet magnets on our fridge, an alphabet poster, starfall, and the ABC zoo game from Fisher-price's website. At first he just banged the keys in the baby version, but now I show him where the letters are on the keyboard and he pushes them in the toddler version. Now at 25 months, he is reading several words, and is very solid on his letters. He continues to amaze me as we continue our adventures in reading. Here are some of the materials that I’ve made to help my children learn to read. I have made several flip-up chart with rhyming words, and his attention span for these has been great. I used A.P.P. 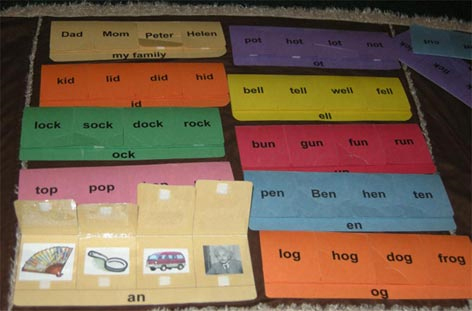 's phonics files that he shared with the yahoo group to get words and pictures. For example, one of them is for at, using the words cat, mat, rat, and bat. At the bottom are the letters "at". We read the words and then he lifts the flap up to see a picture of it. I printed them on construction paper, glued the pictures on (which I had printed on white paper so the picture would look nice. I then laminated them and used velcro stickers to make them stay closed. It was a bit of work, but Peter really loves them. My cost for these was about $0.40 apiece. He often pulls these out and independently plays with them. He sees the word, and with a little effort, is awarded with a picture.